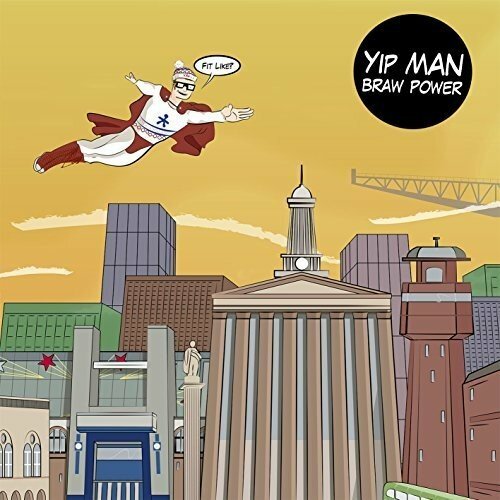 When the swirling ‘Like A Rolling Stone‘ style organs immediately charge ‘Barnburner‘ into life at the start of Yip Man‘s debut solo album, you start to brace yourself for a kind of Dylan meets Springsteen affair. Whilst Braw Power does raise a glass to those two luminaries at random places throughout its duration, if you were expecting ‘Blood On The Badlands‘, you would be woefully mistaken. The man behind the mask here is the astoundingly clean looking Al Reno (I am not referring to his drug habits here. I have no idea even whether he even HAS drug habits or just succumbs to the odd weekend bender. He just looks like he has a very thorough wash every day. This is a good thing). Some folk may remember Reno from the genre defying Glasgow duo Le Reno Amps, further renouncing the idea that we will be partaking in a journey of the American West. If anything, the likes of Elvis Costello and Graham Parker have been as much of a blueprint as anybody else on the likes of ‘Not That Easy‘, and there is a cheeky nod to The Beatles‘ version of ‘Twist And Shout‘ halfway through the buoyant ‘Crying Thunderstorms‘. Or is it more like the start of Bowie‘s ‘Let’s Dance‘? Your call. ‘Skinny White Ghost‘ is somewhere between The Broken Family Band and Squeeze. In fact, the classic school of songwriting is something that is an ever present in Yip Man’s music, though it would appear that, while he has not exactly ripped the rule book from said school to shreds, he has at least crumpled it a little. These are very immediate compositions, perhaps a little too throwaway on the odd occasion, but then, who doesn’t love a good old throwaway pop tune every now and again? ‘Silver Wings‘ begins like a minimalist version of Pavement before eventually sounding like it had been written by Costello for Pixies‘ 1990 album ‘Bossanova‘. ‘It’s About Time We Stopped‘, by contrast, is an affecting ode to drunkenness and debauchery by the sound of things: “It’s about time we stopped before the blackout, film camera rolls to fill in all the holes / and retrace our steps as if the best nights you can get are the ones you don’t remember, or the ones you might regret” sings Reno, before venturing “and baby if there’s one thing that’s true, I don’t know the first thing about you / doesn’t mean that I didn’t love you once‘, at which point the song explodes into being and becomes a boozy ramshackle racket by its conclusion. It’s terrific, and right up there with the best tunes of 2017. Less than a minute later, an odd half-reprise of ‘Stuck On Repeat‘ from the middle of Braw Power, but now featuring a kind of Afro-shuffle instead, closes proceedings. As debuts go, this is a fine taster for things to come, and leaves you hungry for whatever Reno may be cooking up next. Braw Power is out on Armellodie Records on 11th November 2016.